In accepting the proclamation, Shead said he strives to be a person kids can look up to, both on and off the field. 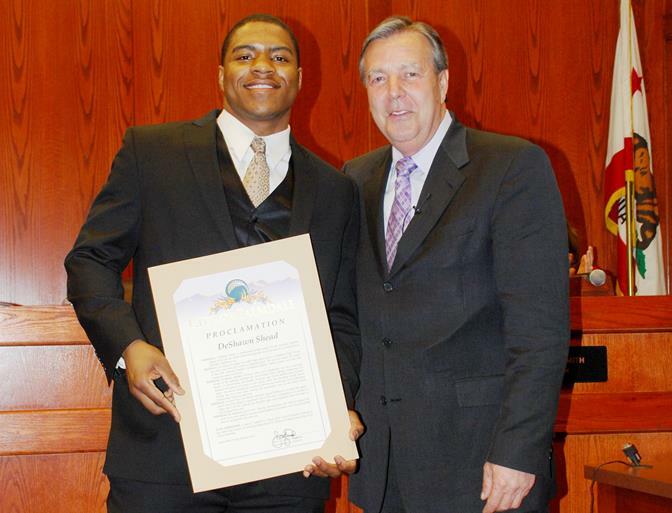 PALMDALE – The Palmdale City Council Wednesday night honored a Highland High School graduate and member of the 2014 Super Bowl winning Seattle Seahawks football team. DeShawn Shead was presented with a proclamation declaring today, March 6 as “DeShawn Shead Day” in Palmdale. 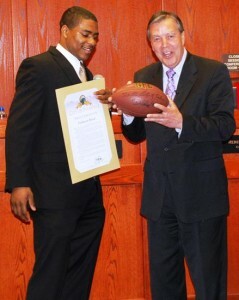 Shead also gifted the city of Palmdale with a signed football. Shead is the first Palmdale resident to win a Super Bowl. 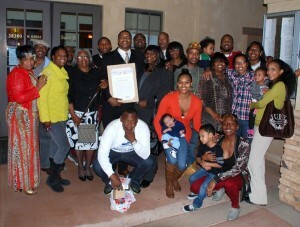 Shead and family members pose for a picture outside City Hall. Shead enjoyed a highly successful high school career at Highland High School and was a two-time All-Conference defensive back. He was also named the winner of the 2006 National Football Foundation Scholar Athlete award, and holds the school’s pole vault record. He attended Portland State on a scholarship, where he was a four-year starter in the defensive backfield for the Vikings, registering 211 tackles, 11 interceptions, five fumble recoveries, four forced fumbles and 29 passes defensed throughout 44 games in his career, while also handling kickoff return duties. He was an All-Big Sky conference selection his senior year, a second-team All-Big Sky his junior year, and earned his teammates’ vote as the team’s Most Outstanding Defensive back. The Seahawks signed Shead as a rookie free agent in April 2012, and he has since played a significant role on the team, culminating in a victory in Super Bowl XLVIII. Shead was also presented with awards from State Senator Steve Knight and the Antelope Valley Hispanic Chamber of Commerce. 5 comments for "Palmdale honors Super Bowl champ DeShawn Shead"
Met him, and his mom last night at el polo loco, very nice people…..his mom was a really awesome lady…. Congratulations DeShawn!! We are all proud to have you as a member of this community and a good role model for the kids here. This is welcoming news. I had no idea that DeShawn was a Highland HS graduate and it’s nice to see the city of Palmdale honoring him for his accomplishments. Congrats! Go bulldogs!!! Class of 05 !!! Congratulations Deshawn! Congratulations on setting your goals and achieving them. It’s nice to hear stories like this come out of my home town instead of the constant negativity. Keep up the wonderful work.